Many applications for grammatical concepts involve flash cards or illustrated images of grammatical concepts and their use in sentences. There are a few that have come out recently that show animated verbs. One application uses real-life videos and explanations of verbs in sentences. This application is called Autism Language Learning. Do not let the title of the application deceive you; this application can be used with students with and without autism. It provides excellent visual and audio explanations of pronoun + verb + ing sentences. Continue reading for my review of Autism Language Learning as well as a giveaway of the application! I have not seen anything like this application on the iTunes Store. It is absolutely helpful for teaching pronouns as well as verbs + ing with real-life videos. There are videos of each pronoun type performing actions. This application is perfect for young children learning pronouns or basic verbs. The application is simple to use; all you have to do is select a module and press the arrow keys to view each video! Videos are stored within the application. I would love to be able to add videos of children/adults performing more actions or see more actions added to the application in the future. It would be great to see a video list (on a separate page) to be able to decide which videos to show a student. Grammar - This application focuses on pronouns and verbs. Turn on the sound to teach the concepts to students. Press the "Mute" button to have students state pronouns and verbs aloud without a verbal cue. Expressive Language - This application focuses on pronoun + is/are + verb + ing sentences and is great for those who are working on that sentence type. You can have students expand their sentences by adding a preposition or adjective based on what they see in the video to a sentence. For example, in the "he is eating" video, students can add "crackers" or "a Lunchable" or "meat, cheese, crackers, and a cookie" to their sentences. Receptive Language - Students are able to learn different action verbs from this application. Have them label the various videos with the "Mute" on. Autism Language Learning is available for the iPod Touch, iPhone, and iPad for $39.99. You can try the Lite version of this application for free. 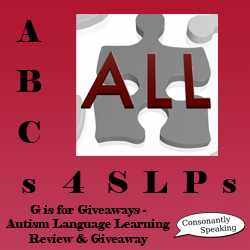 Enter the Rafflecopter below for your chance to win a copy of Autism Language Learning!